Does anyone remember the Golden Viscount that used to fly from Southend Airport in the 60’s? It was pride of the fleet. 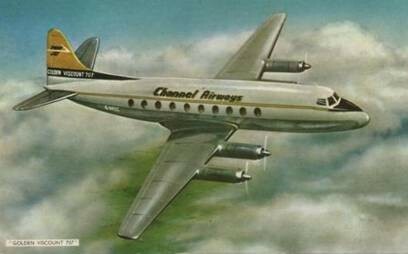 Some weekends there would be an open day, people queued up to go inside and marvel at the wonders of the Viscount with its comfy seats, tiny galley, and a proper toilet. Before the Viscount the fleet consisted mainly of Bristol freighters, so noisy you couldn’t hear yourself speak, and the Viking, a great heavy thing which had a tendency to tip up if not properly loaded, the Dak or Dakota which held 40 passengers, and the Dove which had room for only ten. They all seem very primitive now, but were a lot more fun. This page was added by Mave Sipple on 07/05/2017. My granddad was employed in painting / repair / general maintenance at what was known as Rochford Aerodrome in WW2. He developed lung problems from inhaling too much dust from concrete mixing while filling in bomb craters and repairing buildings. I would be delighted to hear from anyone with any information about the wartime activities of the aerodrome, and if anyone has any knowledge of him. His name was William George Daniels (1899 - 1967). As a teenager I worked for the airline as a baggage handler, loading this very plane. I remember it well as it had a very distinctive sound to its engines. Our house was in line with one of the runways - not immediately by it, but not too far. Anyway, when it started to taxi round for take off I could hear it coming and especially when, at the end of the runway, it revved the engines up to speed that was when it sounded the best. Also back in 1970, my future wife and I went on one when we holidayed on Jersey. The travel there and back was by Viscounts. Fabulous and never forgotten. Only the second time I ever flew, the first time was on a Bristol freighter plane out of Lydd in Kent over to Ostend. My best friend at that period had both his Grandfather and Father working at the airport.